Beautiful Lake Logan in Pisgah National Forest is part of an Episcopal church retreat center that now welcomes individuals and couples! They have a variety of accommodations including large cabins and lodge that will accommodate groups of up to 150 people. Individual rooms are often available, so book your own personal lakeside retreat. 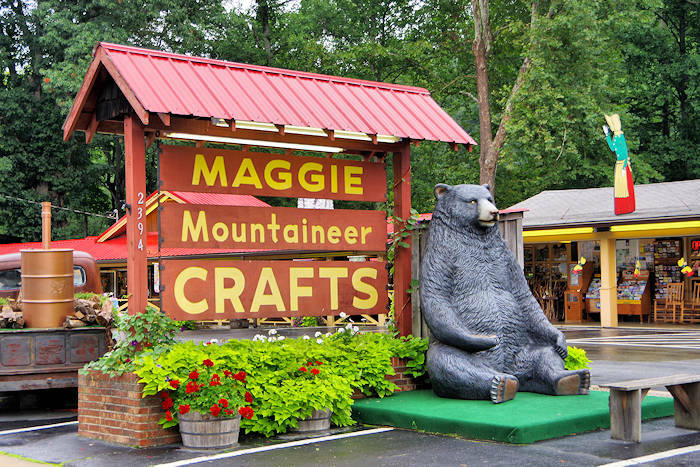 The center, located on the Forest Heritage National Scenic Byway, is open year round. 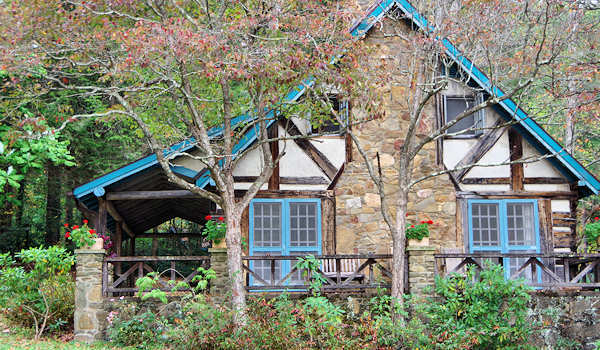 In their Sit 'n' Whittle Village, six cabins and a lodge were moved from the Great Smoky Mountains National Park and reconstructed here in the 1930s. 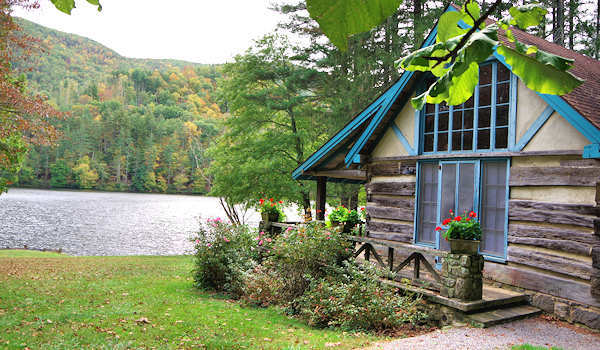 Lakeside Cabins each have four bedrooms, sleep eight, and include lake-view decks, kitchenettes, and gas fireplaces. The Retreat House with a full kitchen is ideal for groups up to 14. Their Eastside Cabins are white clapboard with spacious porches and are perfect for individuals and couples. One Eastside Cabin sleeps eight in four bedrooms and has a full kitchen. 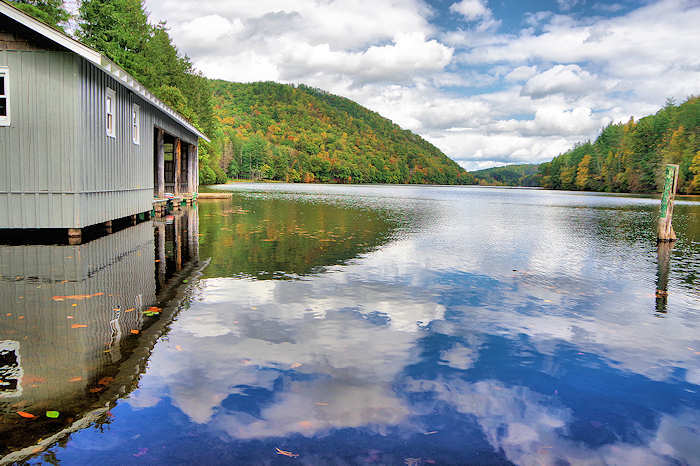 You'll have access to their recreational options including the lake, canoes, stream, and hiking trails. It's a fabulous summer swimming spot. Day passes for swimming and hiking are available for $10/couple, reservations required. The Bishop Johnson Dining Hall offers buffet meals, including country biscuits made from scratch, in-season vegetables and blackberry cobbler. Meal times are 8 AM, 12 Noon and 6:30 PM when groups are booked - so meals are by advance reservations only. While they do not sell alcoholic beverages, you can bring your own to enjoy in your cottage. The history of Lake Logan begins in the early 1930s, when the logging town of Sunburst was deserted after all the timber was clear cut. Champion paper mill downstream in Canton built a dam to create a lake as a water source. They built an "executive retreat" on the lake and used it until the 1990s. In 2000, the retreat was sold to the Episcopal Diocese of Western North Carolina and land protected by a land conservancy. It has been expanded several times to become a beloved conference and retreat center. Outdoor festival with plenty of live music, food trucks, beer & wine and more at Lake Logan in Pisgah National Forest south of Waynesville, about 30 miles from Asheville. Day passes from $45/person. Camping and accommodations available - reserve early.